I love color wheels. I think of them as rainbows, full of hope, no two exactly alike, representing an infinite number of possibilities. I must function within the wheel of color if I am to work with color at all. During the course of my struggle with watercolor, I became aware of a simple but startling fact: I often found more "color excitement" in my large plastic palette surface than I found in my painting. For example: I would mix yellow and red together on the palette to get a secondary orange. Then I would tone down the orange's brashness with a touch of blue and carry the mixture on my brush, to the surface of my painting. But in the process I left behind the excitement of the remnants of the primary colors that were hinted at in the secondary and tertiary colors. The hints of those primary colors were found on my palette, not in the painting. Occasionally I might add a bit of orange to a blue shadow by mixing the pigments on the painting surface, but that was a small exception to my rule of procedure. At that Point I found my color statements rather dull and lifeless, and I'm sure the public viewed my work the same way. Out of a gradual self assessment and critiquing grew an attitude about color "mixing" that I now hold to with a fair amount of regularity. I like to mix my colors directly on a wet or damp surface. I keep my reds, yellows, and blues segregated on the plastic palette, and I'm careful not to let them blend on the palette. With this technique, you can see the presence of some of the primary colors showing through in the dominant secondary or tertiary colors within my painting. The color excitement that was once found only on my palette can now be found, to a degree, in my finished painting. I produce greens by mixing and blending yellows and blues right on the wet surface of my painting. For sunny green, I add a bit of red and sometimes a fresh yellow, which I can cool with a bit more blue to produce a shadowy effect. When the painting dries, I will find hints of some of the primary colors in the secondary color. These paintings demonstrate the excitement of mixing and blending primary pigments together on the wet watercolor paper to produce secondary, even tertiary colors. The hints of the primary colors are in background, subject matter and foreground add an element of spontaneity and light continuity. 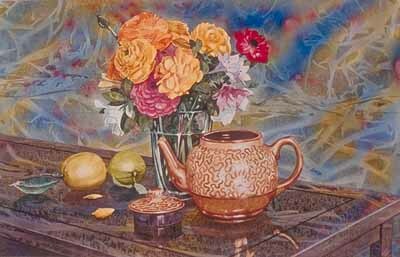 Watercolor painting demands that you work rapidly so that you can take advantage of the variety of effects obtainable while the paper is wet. It's easy to suffer an anxiety attack when you have to adjust values in different areas, control color dominance, and try to produce a pleasing variety of edges between shapes all at the same time. Painting with watercolors for many years has taught me to look for ways to "bite off" only what I can chew. For instance, lets say I want to paint an entire page with some abstract design elements and textures as an underpinning. In such a case I would paint in a light value for the under painting. By leaving some light areas, even some white of the paper exposed, I will produce a transparency and luminosity as the rest of the painting progresses. As I continue to layer images and shapes on the ground surface, I can select and concentrate on smaller areas to develop. I love to paint on wet surfaces; it's a wonderful control device. When I charge pigments onto a wet area, the pigments will not go beyond the wet boundary. I can actually regulate my paint flow by simply controlling the wetness of the paper. These paintings illustrate the regulation of paint flow by controlling the wetness of a given area. 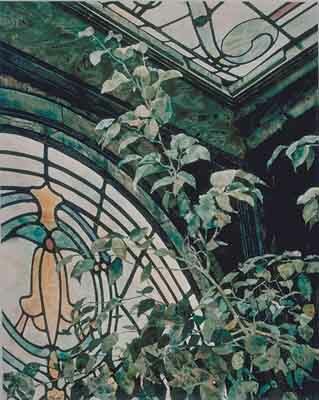 The live foliage was preserved as white paper during the painting of background because these special shapes, be they a flower bud or a leaf are kept dry as the primary pigments are "charged" into the wet surfaces that surround them. 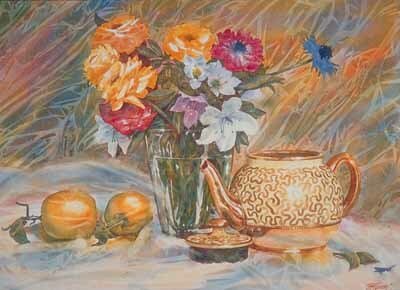 In order to adjust the value or temperature of a watercolor painting, you need to know about glazing. Solutions used for glazing should be composed mostly of water with small amounts of pigment. Opaque paint is easy to glaze with because the pigment lies of the paper's surface. The glaze does not actually alter the pigment underneath it; you will see the color and value of the underpainting reflecting through the glaze. Any paint pigment can be used for glazing if a couple of precautions are followed. First you must work slowly. Only slight changes are necessary with each glaze application, so make your changes in gradual degrees. Mix your glazing solution of water and pigment, then test the potency on a small piece of the same kind of paper you plan to work on, which I call a "trial patch." You should paint only one application or layer at a time. Allow the paint to dry completely between applications. You can judge the success of an application only when it is dry. These paintings show the use of glazes to produce much of the mood of the light for sky. 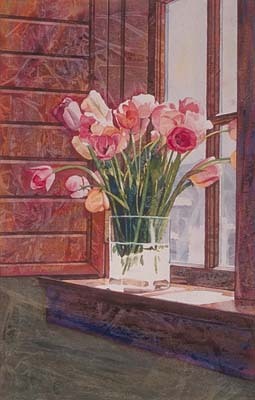 The glaze is used carefully in foreground to give the feeling of light continuity that all good watercolors must have. Go slowly with this process. Make sure each glaze has dried before applying the next water pigment mixture. John Koser's family supported his love for drawing and anything artistic. As a teenager he studied with William Frederick Foster and Nikolai Fechin whose fundamentals of drawing and composition formed a solid background for his art career. 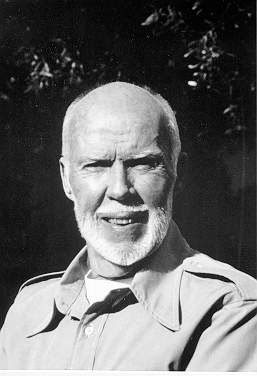 After serving in the Armed Forces during World War II, Koser entered Colorado College and studied at the affiliated Art Center in Colorado Springs. Attending Baylor University and the University of Southern California, he received his Doctorate in Dental Science, which led to a position as Technical Instructor for Visual Education, USC, School of Dentistry. In this capacity, he co-authored and illustrated two dental textbooks with over four hundred illustrations in each. The textbooks received international acclaim and were translated into German, French, Japanese and Portuguese. In 1971, after a serious illness, Koser retired from dentistry and returned full-time to the artistic career he had abandoned as a young man. Selected art study with Grace Lodi, Leon Franks, Robert E. Wood, Morten Solberg and Judi Betts had a powerful impact upon the techniques and philosophy behind Koser's work. He has had twenty-five one man shows including "Images of Britain" at the Museum of North Orange County, and "Colonial Doors" at the Muchenthaler Cultural Center Museum. In 1997, the Muchenthaler Cultural Center Museum mounted a 25 year retrospective show of seventy-five paintings representing his watercolor journey since 1972. Koser teaches workshops and participates as a juror throughout southern California, but guards the "preciousness" of time to devote most of his energy to his painting. Koser's works appear in private and corporate collections throughout the United States. His painting "Our Heritage" was selected by Maruka Machinery Corporation International, Japan, for a limited edition print to commemorate the Akiyama printing process. "Watercolor - Red, Yellow and Blue" is the title of a textbook written and illustrated by Koser and published by Watson-Guptill, Incorporated. 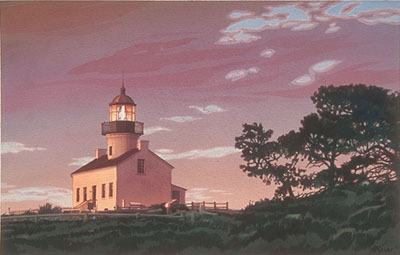 He has also been a major contributor to other Watson-Guptill publications: "Everything You Ever Wanted To Know About Watercolor," "Painting the Landscape," and "Sketching Techniques." His work appears in articles written and illustrated for "The Artists" magazine and "American Artist" magazine, where he currently holds the honor of Editorial Advisor. Billboard Publication's Fall edition of "Watercolor '92" and Winter edition of "Watercolor "97" feature major articles authored by Koser on his painting techniques. His most recent major article is "Composition 101" appearing in the September 1998 issue of American Artist magazine. 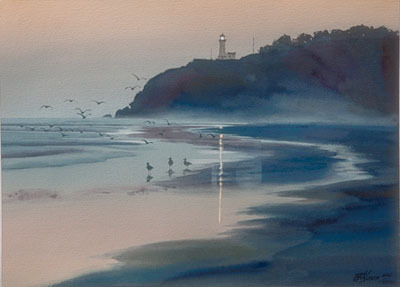 Koser served two terms as president of the transparent watercolor society, Watercolor West, and is now a life member and member of the Board of Directors. He is also past President of the San Bernardino County Museum's Fine Art Institute.